Jacob “Shakey” Butler is an award winning fulltime artist that specializes in live art and portraiture. He is not your typical artist, he is raw, energetic and self-taught, who paints everyday out of his studio in Fremantle, Western Australia. Within his short career, he has been headhunted for live painting events at some of Perth’s largest galas and functions. As well as private corporate events and concerts, he has recently kick-started live wedding art with his first event at the wedding of Annabel and Robbie Gray in Victoria. Branded “Shakey’ by his mates due to his essential tremor, his inability to keep his hands steady has given him a raw style and energy that is unique and unparalleled. It is a truly unforgettable spectacle to witness him paint live! Jacob “Shakey” Butler will create a painting live at your wedding. A subject can be chosen prior to the event or you can leave it in his capable hands to chose a highlight of your day that he will paint using photographs captured on the day.The painting will commence immediately in the reception area for the wedding party to be amazed as the painting unfolds in front of their eyes! At the end of the night the bride and groom can take home with them an art piece that they will truly treasure forever. 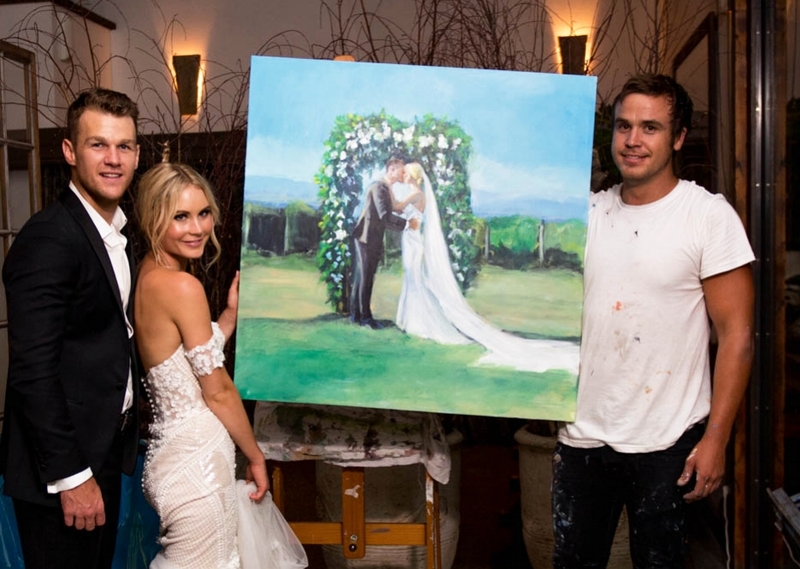 "Jake painted at our wedding and it was such a highlight for us! The end product was so incredible and, as a keepsake we can keep forever, we could not be happier with it- but aside from that he was just a friendly, fun and easy going person to have around. He made sure he painted something meaningful to us and talked to us before the day about what we wanted to capture in the painting. All of our guests absolutely loved being able to watch the work come to life over the course of the evening, everyone still talks about it! I could not recommend Jake more highly, he made our day even more special and provided such a unique and memorable experience for us and our guests. Jake painted the most beautiful portrait of my Husband and I at our wedding LIVE in February! It is the most amazing painting that we will cherish forever. Jake flew from Perth to Melbourne with only one months notice and at no point was anything too difficult. Still to this day the guests at our wedding comment on how talented and entertaining Jake was! Jake is incredibly talented and has given us a gift of a lifetime. Jacob attended our wedding earlier this month as a suprise gift from my parents and took photos whilst at the church, later that evening he painted an amazing canvas of our first kiss in front of all our guests.. the guests are still commenting on how amazing it was to watch it unfold and see bit by bit how it was made. I cant reccomend Jake enough! !